HBO's new adaptation of Ray Bradbury's iconic sci-fi dystopian novel is a strange and bloodless beast, differing wildly from the source material, handsomely designed, yet lacking in real punch. The film stars the wildly talented Michael B Jordan (BLACK PANTHER's antagonist) as Montag, a Fireman whose job is to burn books. Not just seditious books. All books. Because in this dystopian future books are scene as sowing chaos and frustration - giving people too many ideas - ideas that confuse or offend. As the film progresses two important character developments occur that felt unearned and unexplored to me. The first is that Montag steals a book - in shock that a woman would love them so much she would commit suicide rather than survive them. This leads him to speak to Clarisse (Sofia Boutella), an "eel" who subversively reads books, leading him to a spiritual awakening. Boutella is wasted here in a thin role that's basically a plot advancer. The second thing is that we learn that Montag's supposedly dogmatically rigid boss Beatty is actually a secret reader too. And yet Montag never looks intellectually enquiring and Michael Shannon gives his standard 2-D performance as snarling baddie. 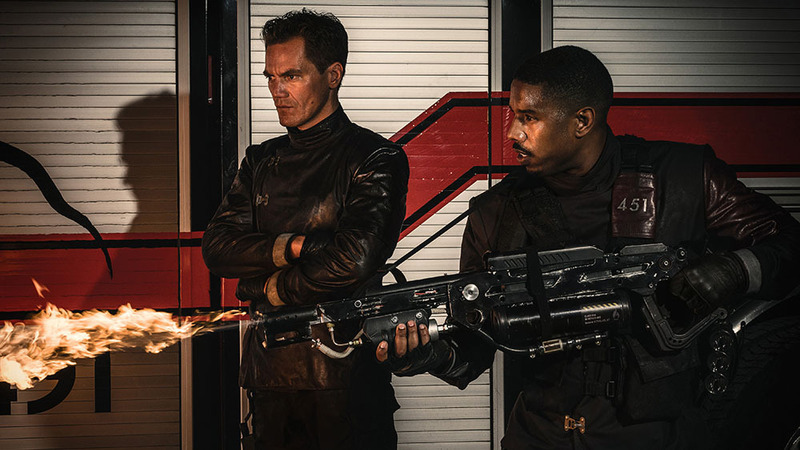 FAHRENHEIT 451 has a running time of 100 minutes, premiered at Cannes 2018, and was released on HBO this week.